You are in for a real treat if you are lucky enough to find availability at the Wakefield Guest House located just a few minutes north of Sechelt, on the Sunshine Coast of BC. Sparkling and new, Wakefield is a private vacation rental where you will be immersed in luxury. The owners of this home have paid attention to every detail to ensure your comfort and it is a spectacular home away from home. This vacation home sleeps up to 6 people, but is ideal for two couples. There are two master suites, both with queen beds and luxury linens. Flat screen tvs and en suites compliment both master suites. The master suites are on opposite sides of the residence for maximum privacy. The couch in the living room is also a pull out bed. How about a BBQ on the deck or a soak in the private hot tub. Both are available for your exclusive use during your stay. After a BBQ and a gourmet meal prepared by yourself in the dream kitchen, you can retreat to the living room and enjoy conversation and relaxation around the gas stone fireplace, while enjoying your favorite show on the flat screen tv. 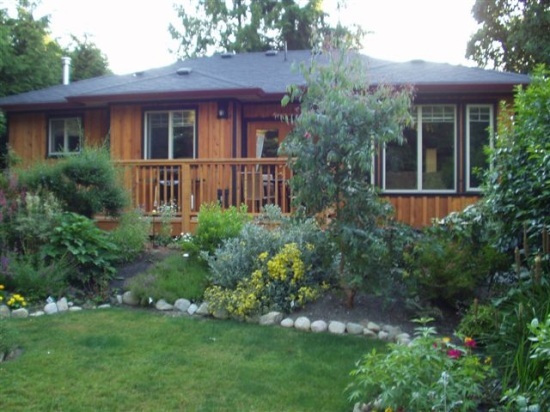 The Wakefield Guest House is located just a few minutes north of Sechelt on Hwy 101, Sunshine Coast BC. The home is walking distance to the now famous Wakefield Beach, where you can view the Trail Islands and there are many nice walking trails in the area. Sechelt BC is located on the Sunshine Coast and is just a 30 minute drive from the Langdale Ferry Terminal. You can arrive in about 1 hour and 20 minutes from Horseshoe Bay, West Vancouver BC. The village of Sechelt offers many exciting vacation opportunities and events through out the year and this vacation home is ideal as a base during your stay. Contact the owners by telephone or email to book your stay.